The Women's Bath on Mogmog. “A long time ago there is a well at the back of this village, that was for the men," Hosay recounts. "They would go and bath in there, swim in that well, because it’s big. Mostly in the evening. But sometimes whoever wants to, anytime they could go to bath there. No problem. And that’s where these women got their water, their drinking water. Same place. "When the women would come to get their water, they would go to the back side of the well where nobody is churning up the dirt. That’s where they got their water, but that’s the same water that we would swim in, on the other side." 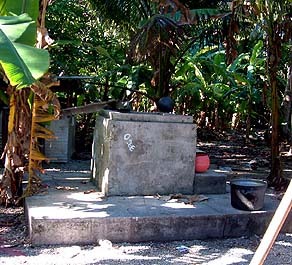 “There is also a woman’s well that they would use to go and bath there. It’s a different place, a women’s place. But if there are menstruating woman that they are staying in the woman’s house, that’s where they get their drinking water. During the Japanese time, then we learn that it’s bad to drink that kind of water. It’s brackish water. “We didn’t collect rain water in old times, because there was no way to collect rain water. No empty drums. We didn’t have anything to catch the water. The only pots that we had before, long time ago, was this clay pot that they made in Yap. It was just for cooking, but not for catching water, because if we used it for our water, there would be no pot to cook in!" Not much remains of the Men's Bath. 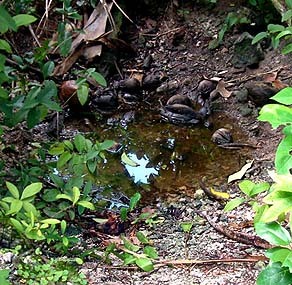 The murky water of the Women's Bath, with vegetation debris visible underneath. “People no longer use the old baths," Lourdes says. "Maybe we know that with all the people going there and swimming around, maybe there is disease or something. Now we’re small and we’re weak, but before, the people before, they were really strong and really tall and big. 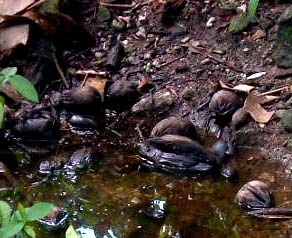 And their kids, when the parents went to those water holes, they’d find breadfruit leaves all way down in the bottom in the water. “They took this the mud and breadfruit leaves, just rinse it a little bit in the water, and they roll it up and squeeze the juice into the child’s mouth, and the kids would drink it. They said that’s medicine, only for kids." “And for us, it was the coconut fruit from under the water. The kids would take a shower in the water and find the coconut fruit, and we’d eat them. I ate these from the time I was small. The coconut fruit beside the water, in the mud. When you cut it, it’s white, and then you start eating. Even myself, I ate those, and I know that maybe that this is in older kind, it’s really inside the people. "But now, for the baby, we boil their water and make their food nicely. And the kids get sick. In the old days, we’d just walk around and find copra on the ground and eat it. And it seems when the flu would come, it was really hard to get those kids sick. They didn’t get sick so easily. “And the women, when the stay in the Women’s House, somebody would go and take some water from the Women’s water, and the Men’s water—out of the bath—and they’d bring it for them to drink. No problem. But now you cannot tell somebody to go and take some water there." Coconuts in the water around the edge of the Men's Bath. 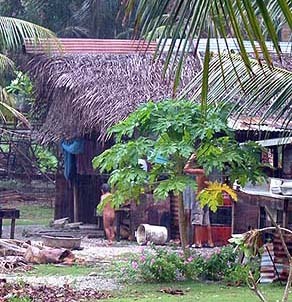 “In the olden times, we got water on Fedraey using the coconut leaf sheath," Albert says. "They cut the sheath and tie it to the trunk of the coconut tree, and that’s how they caught water. When the water flowed down the trunk and its drawn off. 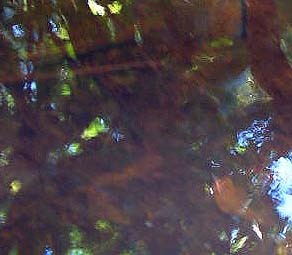 But when you look at the color of the water, is not clear, but it’s kind of a brownish color. But they drank it, they drank that water, because it’s better than they just drink the water from the well." "They caught the water in a small gourd, and also when the Spanish came, there were big pots, like a vase or something. And that’s what they got from the Spanish, and they really kept these, because otherwise you just take the small gourd and catch water with it. "But when I was growing up, my grandma had a big pot like that. And that’s how they got the water. They say, ‘Albert, you drink that one.’ But right at that time, we got big metal drums. So we also use flat tin to get water from that drum. And it’s clearer than the water caught using the coconut leaf." 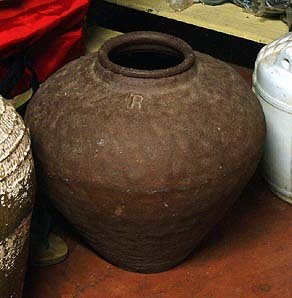 An old Spanish pot like the one Albert describes. Imeongs Collection, Colonia. Children shower in the rain, while a 55-gallon drum catches rainwater off the roof of the house. "I don’t think any of those old vases still exist here any more. Some people, like when the military ships came in, when the soldiers saw those thing, they wanted to get them, and we gave them. Like, you can give us this, and we can give you that, so we exchanged, we traded, and so we gave them those pots. "Maybe they gave us, lets say, a case of soft drinks when we gave that to them, because we didn’t know that those are rare. It’s hard to find them now. Maybe there are no more. So we have a plastic, we have a drums, but no more of that kind right now, it’s hard to find." “For water supply on Asor, we just have rainwater catchments," Isaac explains. "We have three community water catchments on different parts of the island. We also have water wells here that people use for shower, but since there’s not many people here, there’s no need for separate places for men and women to take their showers. "If the ladies are out there taking their bath, then the men wait around until the woman finish. That’s at probably, maybe 5 or 6 pm. When they finish, they go home and then the men will go there and take their baths. It’s just open around the well." A modern community well on Asor. 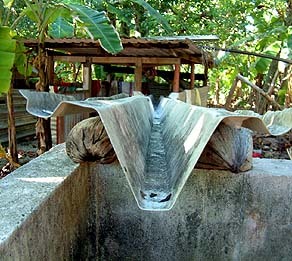 A gutter is used to carry water from the well to the bath house. “According to my elders," Hosay says, "a long time ago, we didn’t really use water for gardening because we didn’t do much gardening. We just depended on our swamp-taro patches, and then this breadfruit and this kind of tree we call yabuuch. Even banana trees were few. The sweet potato, I think maybe during the Japanese time they introduced this, but we also didn’t really need water for that, with it raining as much as it does here." 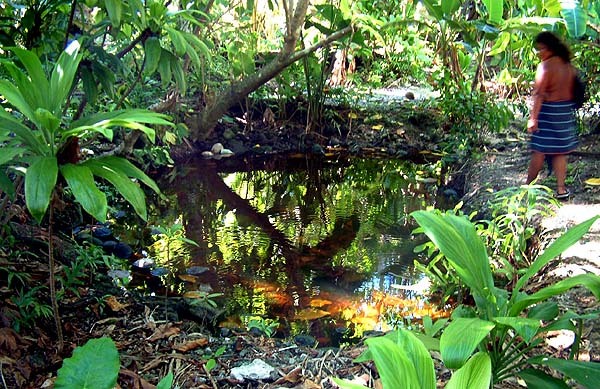 The close relationship of water to food leads us to look at planting in Ulithi.